The Ottocanali 4K4 is a flexible and reliable 8-channel power amplifiers with up to a total of 4,000 W at 4?, ideal for multi-zone applications in small to mid-scale installs. Ottocanali 4K4 supports any combination of lo-Z loudspeakers, mono-bridgeable channel pairs and 70V/100V Hi-Z distributed lines with no need for output step-up transformers. The Ottocanali 4K4 features switchable main/aux signal inputs and offers a wide range of system control, alarms, GPI/O and monitoring functions as well as sound shaping options. The Ottocanali 4K4 implements redundant universal switch mode power supplies with PFC and patented SRM (Smart Rails Management) technology maximizing reliability, efficiency and reducing power consumption. 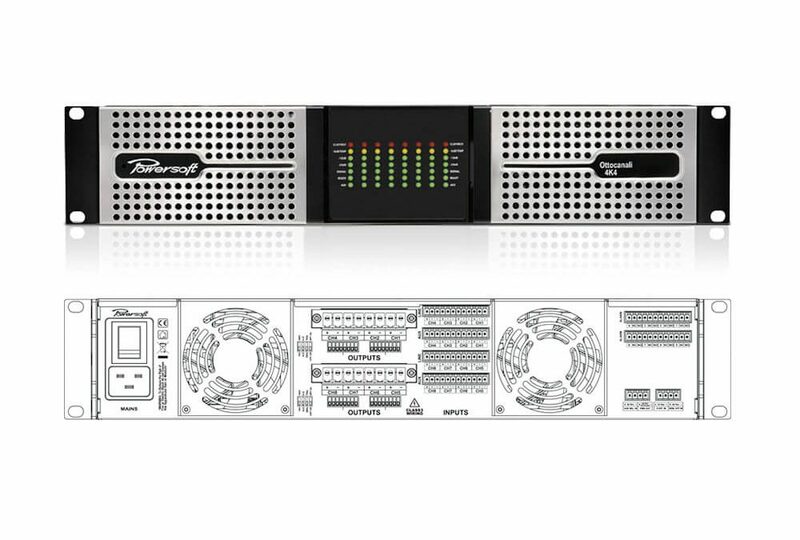 New Ottocanali 4K4 DSP+D heralds new and innovative level of signal processing, providing non-boolean routing and mixing, multi-stage equalization with raised-cosine, IIR and FIR filters, delay up to 2 s in input processing and 100 ms for time alignment, gain and polarity adjustment, crossover, peak limiters, TruePower™ limiters and Active DampingControl™.